I walked into the shop to see once again things were changed out and rearranged. There is never time for the dust to settle too much at this spectacular flower shop in downtown Fuquay-Varina. Seen amongst the industry as one of the top florists in the area, Donna Pittman was busy showing her incredible husband Jack and a steady helper on a ladder exactly where to hang the curtain in her new “bridal consultation room”. No details were left out as Donna wanted to create a space that was an extension of a home with soothing monochromatic colors and enough sophistication that you felt special without that feeling of stuffiness. Donna knew I wanted to chat with her about the business so we went over to Nil’s where we could get a hug from Sibel and sip on some wonderful sweet tea. I asked Donna to tell me her story. How she got started, what inspires her and how she has made it as a small local business for 19 years! Below is her story. Donna started out in Cary, NC around the year 1987. She spent ten years in Cary prior to landing in Varina …. strictly by chance. There was a business in Varina that worked on “golf carts” and Donna needed her cart repaired for her kids. She brought it to Varina and while walking around she stumbled across the space where she has called “home” for 19 years. Now, for those of you who think Varina has always been the booming area of town you need to be brought up to speed. You see when Donna found this “space” there were only three or four businesses in Varina. Below is what the storefront looked like right after she moved in and a view of what “Varina” looked like during the time she decided this was the place to relocate. To say Donna had “vision” even then would be an understatement. Most would have looked at the space and said, NO WAY. But Donna saw a diamond inside those walls. She knew with a lot of hard work she could make this the place where her business could grow. Years have passed by and Donna has seen many changes. She said Varina Station really put Broad Street on the map. Once the new mix of residential and retail came in things started lighting up. Some businesses have landed that have been a draw for people outside of Fuquay-Varina. She chuckles when she now gets calls for directions, all she has to say is, “We are across the street from Aviator, Do you know where that is?”. Gone are the days where people are riding around on Main Street and she has to explain how to get them routed to Broad Street. I then asked Donna what was her “moment”. The moment that she remembers that is so special to her. She quickly said …. Juli Betts wedding. I know Juli very well so my ears perked up. What about Juli’s wedding. Donna said it was at THAT wedding that she felt she had been validated as a “real professional”. She said Juli and her mom came in to meet with her. They didn’t get into the details, they simply said …. “We trust you”. Donna was then able to create the wedding of Juli’s dreams based off a trust that it would be beautiful. I called Juli afterwards and shared this with her and asked her to send in some photos. She was out of town but that awesome husband of hers delivered the goods! 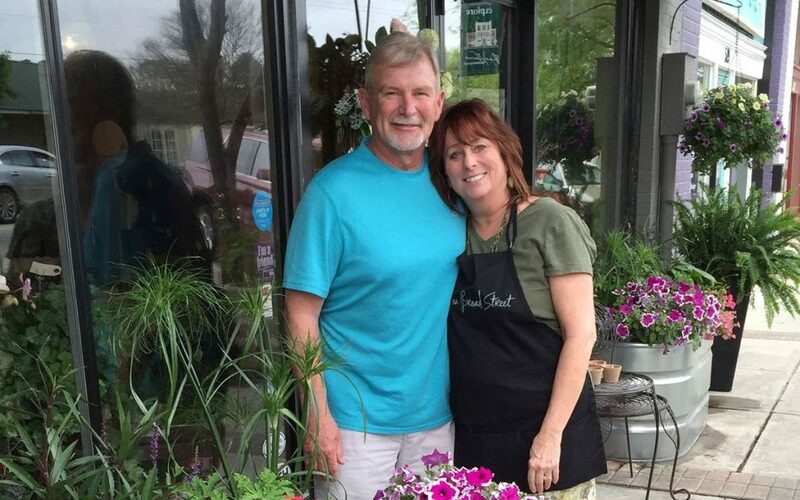 Donna is now known as one of “THE Florists” in Wake County for weddings. Her trademark look is organic. She utilizes many local growers, which even consists of her own personal garden! Her yard is full of unique flowers ready for their next bouquet. Last year she produced 92 weddings during a Friday, Saturday or Sunday. She employs two full time designers, two full time support staff, three part time support staff and seasonal staff during peak seasons. Her vision for that run down building has created jobs and for those of us who have watched her business grow, many would say that Flowers on Broad Street helped “Put Broad Street on the map”. When Fuquay-Varina Downtown thinks of our purpose in growing our community it is this kind of story that helps us realize what a special place our downtown is. You see, we get to become friends with business owners like Donna who took a risk and we get to watch and hopefully help them grow. We get to share how a “moment” from a citizen helped mold someone as a professional and send home the message that you never know how impactful your support can be to someone in our community. We get to rally the troops to always remember that supporting a local business will ALWAYS be important to us as a community because without them, our heart of our community would simply die. Donna said that FVDA’s efforts with the “Shop Local” movement was working. She said this past year she has had countless people stop in and say, they want to support local! For her …. She knows the citizens of FV “get it” and they show up to support the local businesses often. THAT is the real key to her success. Stop by this week and check out Donna’s NEW bridal consultant area. Below are some “teaser” images. If I go missing …. I may just be working from her awesome new couch!